Steel box cover with single 1.406" receptacle opening in the center. Rugged construction. 2-5/16" wide x 4-3/16" tall. UL Listed. Steel box cover with 1/2" knockout in the center. 2-5/16" wide x 4-3/16" tall. UL Listed. Steel box cover with single 1/2" knockout in the center. Key hole mounting feature allows for installation of cover without removing box screws. UL Listed. Steel box cover, blank with no knockouts. 2-5/16" wide x 4-3/16" tall. UL Listed. Steel box cover for duplex receptacle. Rugged construction. 2-5/16" wide x 4-3/16" tall. UL Listed. Steel box cover with 1/2" knockout in the center. Key hole mounting feature allows for installation of cover without removing box screws. UL Listed. Raco Handy Box Cover, Flat, 4-3/16 in Length, 2-5/16 in Width, 1 Gangs, Steel, Gray, Galvanized, UL E195978, CSA LR-1082, 1.594 in Opening, For used to close a handy box and also may be used as single gang wall plates Made of a durable polycarbonate material that is virtually indestructible. 1/2" knockout. 4.3" length x 2.38" width. UL Listed. Made of a durable polycarbonate material that is virtually indestructible. 4.3" x 2.38". UL Listed. Made of a durable polycarbonate material that is virtually indestructible. 4.3 length x 2.38 width. UL Listed. Rugged construction, used to close an outlet box. 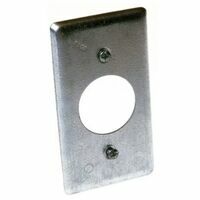 Key hole mounting feature allows for installation of cover without removing box screws. UL Listed. Rugged construction, used to close an outlet box. 4" square. Angled mounting slots allow for correction of box misalignment. UPC bar code. UL Listed. Steel box cover with single toggle switch opening in the center. 2-5/16" wide x 4-3/16" tall. UL Listed. Made of a durable polycarbonate material that is virtually indestructible. 4.3" length x 2.38" width. UL Listed. Lightweight design and durable plastic. Listed for masonry walls. Safe to install and will never rust or corrode. Includes nails for quick, easy installation. 22 cubic inch rigid wall. 3-7/8" x 2-3/8" x 3-3/4". UL Listed. Use two to mount switch box with plaster ears to hollow wall. Slips between box and wall, tabs bend inside box. Used for convenience outlets, switch boxes or small junction boxes. Drawn construction and raised grounding provision. Acceptable for use in 2-hour rated walls. Six 1/2" knockouts (sides). Two 1/2" knockouts (ends). Two 1/2" knockouts (bottom). 4" x 2" x 1-7/8" deep. 13.0 cubic inch capacity. UL Listed. PVC handy box used for many wiring applications. Weather-resistant and nonconductive. Will accept metal handy box covers or nonmetallic covers. Includes hardware for quick, easy installation. Old work wall case. Safe, non-conductive. Two Zip-Mount retainers. Four integral clamps, two each end; mounting ears. 14 cubic inch, 2-3/4" x 2-1/4" x 4-1/8". UL Listed. Steel box cover with single 1/2" knockout in the center. 4" square. Angled mounting slots allow for correction of box misalignment. UL Listed. Used to close outlet box. For mounting switch or receptacle. Size 4" x 4",steel, UL Listed. New work safe, non-conductive. With captive nails. Eight integral clamps, four each side. 32 cubic inches. Meets NEMA OS-2, UL Listed, classified for fire wall assemblies. 3" depth x 4" x 3-3/4". With captive nails. 3/0 - 4/0 combination. Fixture spacing for 2-3/4" - 3", 6 integral clamps. 4" diameter non-metallic ceiling box, 20 cubic inch volume. Listed for fixture support up to 50 lb. 4" diameter x 2-1/4" depth. Meets NEMA OS-2, UL Listed. RoHS Compliance. High impact lightweight round blank PVC cover for 4" round boxes to make junctions. UL Listed. Used to close outlet box. For mounting switch or receptacle. Size 4" x 4",steel, UL Listed. New work applications, shallow PVC switch box. Integral brackets. 1-1/4" depth x 2-3/8" x 3-5/8". UL Listed. Safe, non-conductive. With bracket for 3/8" to 5/8" wallboard. Steel and wood studs, 4 knockouts. 2-15/16" depth x 3-3/4" x 2-1/4".